Second, living room Feng Shui is only a TINY part of Feng Shui. It is not even one of the major areas of focus in Feng Shui. The 3 areas of focus are the kitchen, front door, and bedroom. Their locations, relative to the house’s orientation (and many other factors), has a much bigger effect on your life. So when you go about following the Feng Shui tips and rules listed here, do NOT expect big changes in your life. What you can expect is that you and your guest will enjoy more comfort in your living room. This, in turn, can strengthen both your mental well-being and your social connections. When you enter a house, the first room to greet you should be the living room. Imagine the alternatives. How would you feel if you enter a house and see the master bedroom? Or when you enter you go straight to the kitchen or dining area? Something just doesn’t feel “right”, does it? The living room is ideally the first thing you see when entering from the front door. The living room is a place to welcomes guests. It is the place that you are ok with letting people outside your front door see. It is a public area of the house and doesn’t have much of a privacy requirement. This is why the living room should be close to the front door. 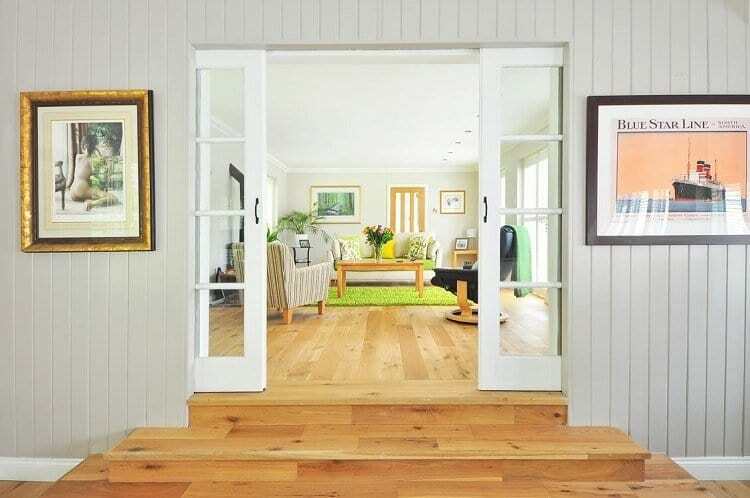 If your living room is not close to the front door, it is fine if it is located at the front of the house. This uses the same concept where the bedroom is suitable at the back of the house. The living room is suitable in the front of the house because it IS the place to welcome both you and your guests. Again, imagine the alternative. If you’re a guest and you have to walk pass bedrooms to the living room, would you feel that you’re intruding the privacy of the host? If the living room is not at an auspicious area, adjustments of the sofa can be made based on your personal Kua number. But remember – adjustments must be practically efficient first. Do not go about placing your sofa in a weird or inconvenient location just so you can tap into the auspicious energies of your Kua. A lot of new-age designs make living room round, triangular, or other kinds of creative shapes. Those designs are not the best. Irregular shaped living room designs are said to attract people that will complicate your social circle. The image above shows a living room with at least 5 corners, which is not ideal. The ideal design is a living room with four corners, like rectangular or square-shaped designs. These designs will help you attract people who are more mainstream, or those who are more righteous or virtuous. But of course, the people you attract have a lot to do with your character as well. Have you ever been to a place where the ceiling is so low that you’re afraid that you’ll hit your head, even though you know you won’t? How did the place make you feel? Low ceiling gives a kind of negative energy that makes us feel compressed. It’s the same feeling some people get when they’re driving a sedan side-by-side with a 16-weel truck. A living room with low ceilings will give you and your guests invisible pressure and great discomfort. Further, because the space is smaller, it is also harder for the place to gather good Feng Shui energy brought by you and your guests. That’s why it is strongly suggested that you avoid this kind of design. This uses the same concept as #5 above. The area where the ceiling is lower gives off the compressive energy similar to low ceilings. 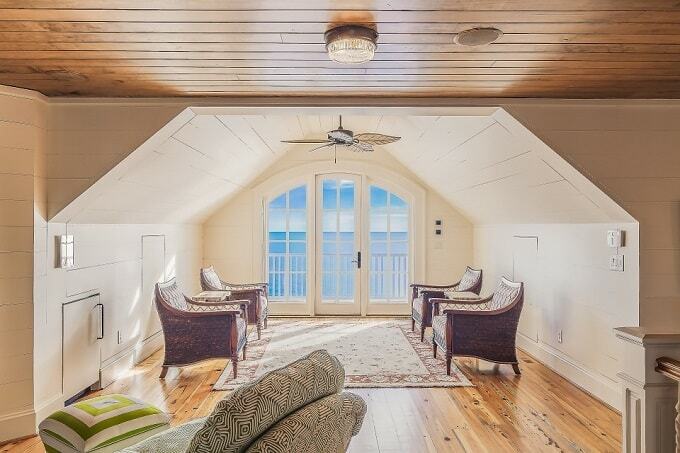 Slanted ceilings are NOT ideal if the end of the ceiling is too low, like the image above. If your living room is designed this way, try to avoid sitting and resting in the area where the ceiling is low. 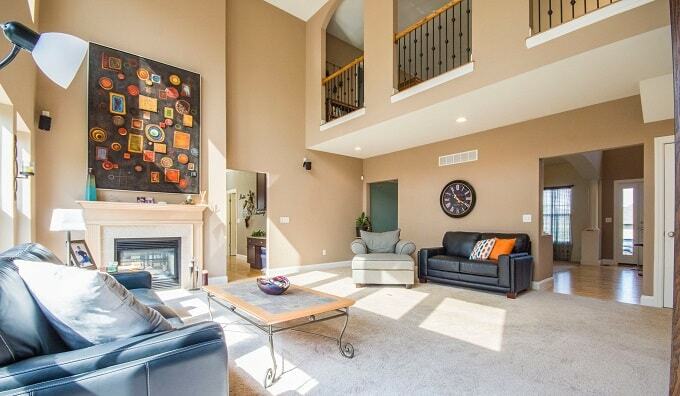 Higher ceilings, even loft areas as high as 2 stories, are favored for living room design. Living room with high ceilings are favored. Because of the extra space, higher ceilings have a tendency to attract more light and can gather more positive energies. In symbolism, high ceiling correlates to having more room to grow. I think most people have at least one window in their living room. But imagine if your living room has not a single window, wouldn’t that just feel depressing? Not only does a lack of window affect the living room’s circulation of Qi, it is also said to negatively impact the occupant’s ability to establish social connections. There’s a chance that the occupant(s) might become more of a loner and would shy away from human interaction. Living rooms with a sliding glass door to a balcony has the same effect of a large “window”. It has the ability to allow more fresh air and Qi from the outside to enter. As for social connections, having a balcony door is said to bring stronger social connections. It brings more chances of getting help from friends or meeting the “noble man”, or people who would assist or motivate you in terms of career, relationship, or health. Display balconies are those that don’t have a balcony door. They are usually out of reach and can hardly be cleaned. They are rare and can only be found in high-rises. The reason why these balconies are not preferred is mainly because they can hardly be cleaned. As dust, trash, and dirt gather, they can be a sight for sore eyes and create negative Qi that can enter through your window. Conversely, having these balconies is totally fine if you can easily have this area cleaned. As previously mentioned, the bedroom is Yin and the living room is Yang. Brightness and light is a form of Yang energy that keeps us awake and gives us vitality (and the lack thereof can get us sleepy). Because of this, the living room should be filled with light, preferably sunlight if possible. The living room should be a bright place, unlike the image above. 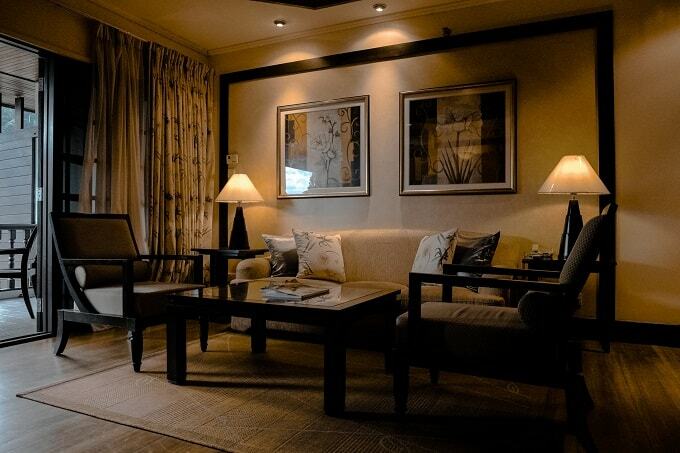 The brightness of the living room is said to affect our mood and energy level. Not only a dimly-lit living room drain the occupant’s energy to go to work, it can also cause unnecessary conflicts within the household because of how it affects mood. How bright should the living room be, then? The living room is bright enough if you can read without turning on the lights during the day and brighter than the bedroom’s lighting during the night (assuming your bedroom is not extremely bright). This is using the concept from the Form School of Feng Shui. For example, light poles, electrical poles, and other pointy objects have a form of Xa Qi (negative energy) and shouldn’t be located right outside your front door. The same goes with pillars because their “Form” is not the best. Chances are that these pillars will bring more negative than positive. If you really desire having pillars inside your living room area, it is better to install the ones with round edges. There are some restrictions on the location of the fireplace, assuming that you use it frequently. If your fireplace is just a display or rarely used, then the concerns below do NOT apply to you. If the living room is at the house’s Northwest sector, frequent use of the fireplace is said to affect the health of the male head of household. This includes heart and blood related issues, such as high blood pressure, cardiovascular disease, and even stroke. This should definitely be avoided if the male head of household is old or have health concerns. For living rooms at the house’s West sector, frequent use of the fireplace can affect the ability to attract wealth and to save money. That’s because West is correlated with Metal and the ability to accumulate wealth, and the fireplace’s correlation with Fire destroys Metal in the Elemental Phase relationships. If you have this problem, the simple solution is to use the fireplace less frequently! Just like the bed of the bedroom, the desk of the work area, or the stove of the kitchen, the sofa is the centerpiece furniture of the living room. As such, the same concept applies. Sofa is ideally placed with a wall behind. When seated, you should be able to see the door, similar to what we call the “command position”. If you can’t place the sofa against a wall, you can place furniture behind the sofa to mimic its effects. Using furniture behind the sofa mimics the effects of having a wall behind the sofa. The furniture is ideally the same height as the sofa. It can be a cabinet or something sturdy and heavy so your movements on the sofa won’t move both the sofa and furniture around. This is a similar concept with the bedroom door facing the bed. When you enter from the front door and go straight, you shouldn’t run into the sofa. This situation is worse if your front door leads to a narrow hallway that leads to a sofa. That’s because this form is similar to a poison arrow, commonly seen in the form of a T-junction. The easy remedy for this situation is to place the sofa elsewhere or place a divider or some type of furniture in between. Keep in mind that doing so is NOT meant to bring out the desired Feng Shui benefits. Nevertheless, it does ease some anxiety for your guests. For instance, let me ask you: are you comfortable taking other people’s seat? Have you ever noticed that when you’re a guest in someone’s house, you kind of notice which sofa is more appropriate for the host, similar to the seats in a corporate meeting room? That’s what you should do for your own living room if you have frequent guests. This reduces anxiety and promotes comfort for your guests. Usually, the sofa that’s against the wall should be identified as yours. One way to do this is to place a small cover on the seat or on the back of the seat that you claim as yours. If you have a walkway behind the sofa, it is said that there’s a tendency that you might attract people that might be of harm to you (in different ways). Also, it may be harder for you to get help or assistance from friends. Relaxing on a sofa with a walkway behind may not give you the most comfortable feeling. This concept is the same as having the stove or bed under a beam. What the beam brings is a form of negative energy (Xa) that can cause issues to your health. Others say that this will put you in a situation where you are “forced to bow, submit, and/or concede”. This only applies if the beam is directly above your head when you’re seated on the sofa. If that’s the case, just move your sofa or couch away from the beam. As for cure, some experts suggested placing large tree-like plants underneath the beam as its upward growth is said to counter the beam’s compressing Xa energy. Is there an ideal place in your living room to put your bookshelves, plate stands, wine cabinets, or other furniture that’s not used frequently? The answer is yes. Just as how restrooms and storage rooms are ideally located in the inauspicious locations based on your Kua, the best places to put rarely used furniture are where there’s negative Form energy hitting that area. These places include areas under a beam or the area that’s at the end of the front door. Qi flow is sometimes similar to how we humans walk around an area. When placing furniture, make sure their placement will not make you feel like you have to walk an extra mile to go somewhere. Convenience is more important than following the tips and rules laid out in this article, depending on the severity of the issue. As Uncle Dixer said: Feng Shui classics said it very clearly: be practically efficient first, THEN ritually correct. 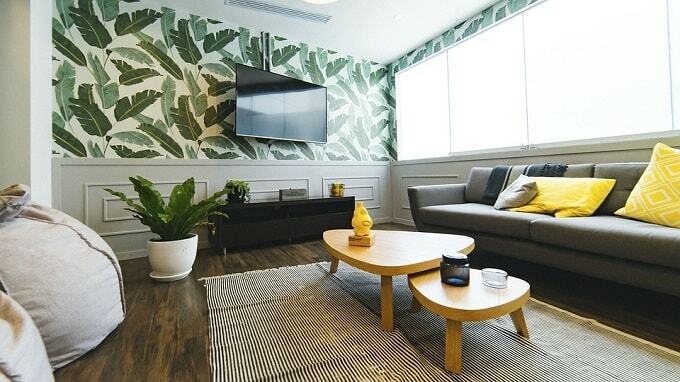 What if you want to put your sofa in an auspicious location, such as in one of the Feng Shui wealth areas, but doing so would place your sofa under a beam? Just as I mentioned in When Bed Placement Rules Conflict, the rule of thumb here is the avoid the negative Xa first, and then consider the positive. Seek peace and stability first, and then go after growth. Think about it. The effects of negative Feng Shui energies are like carrying dead weight. They’re the barriers and obstacles to your goal. How fast and far can you go when you’re carrying all those dead weight? Eliminate them first before anything else! In other words, avoid artworks that bring negative emotions such as sadness, despair, or anger. Even motivational artworks that include inspirational quotes are not best suited in the living room (but more suitable for the study room or workplace). 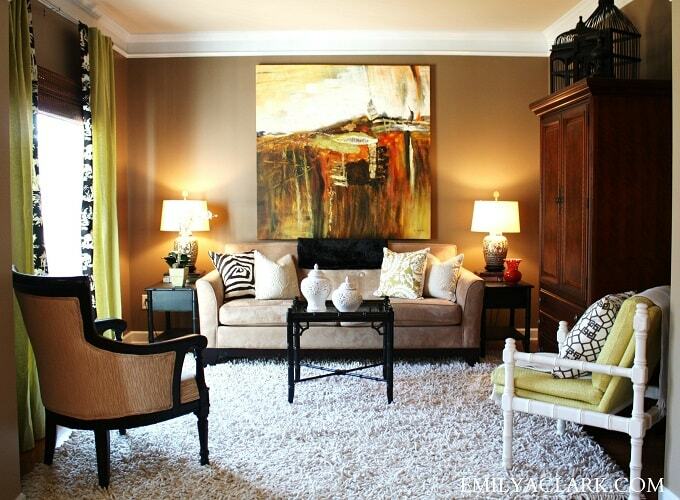 Artwork that depicts flowers, animals, or nature are quite common and are great additions to your living room. Location of artworks and items depends on what they are. 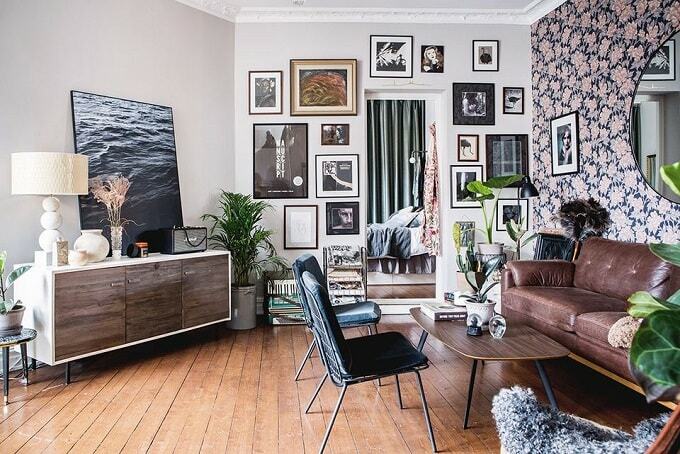 It is common to see artworks like paintings hung on the wall right behind the wall of the sofa. Do not be afraid that the artwork will fall on your head! Hanging an artwork behind the sofa is NOT bad luck totally fine. As for other types of artworks and lucky symbols, like horses, they should be placed with a solid wall behind and NOT have it face towards the outside of the house. The idea here is that wealth should come in the house and not to the outside. Other items, such as the rooster, can be used as a cure for electrical lines (“Centipede Xa”) by having it pointed towards them. If there’s no Xa, or negative energy outside, then there’s no need for the figurine to point outwards. I personally would place something else other than mirrors in the living room, such as a painting or a figurine. Empty space looks great too and is easy to clean! Placing a large potted plant in the living room is said to attract wealth (but placement restrictions apply, see below). The plant should have large round leaves, and avoid those that have pointy, needle-like leaves. Living room is suitable for large potted plants with large round leaves. Some say that the health of the living room’s plant is an indicator of luck of the household. If the plant is blossoming, that means the luck of the household is on a good path. If it is dying, it may indicate that luck is declining. However, I would take this with a grain of salt. I have no case studies about this. Nevertheless, indoor plants are a great addition to your home, and they bring more than just Feng Shui benefits. Although large plants are great for the living room, not all areas of the living room are suitable to place them. 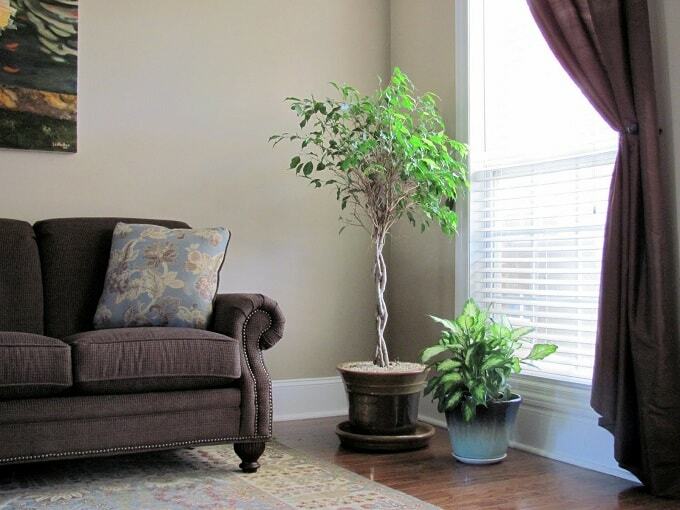 If the living room is at Southwest or Northeast sector of the house, avoid placing large plants at the Southwest or Northeast corner of the living room, respectively. That’s because Southwest and Northeast are correlated with Earth, and plants, which correlates with Wood, destroys Earth. If you place a large plant at the Southwest corner of a Southwest living room, it is said that the health of the female head of household would be affected. Even small plants should be avoided in this area if the female head of household has health concerns. If the large plant is at the Northeast corner of a Northeast living room, the digestive system of the family is said to be affected. The family may feel more fatigued than usual. Don’t forget, you can always put something else other than plants in those areas! The purpose of the living room is for you to relax and to entertain your guests. Unlike the bedroom which prefers Yin energy to assist with sleep, the living room prefers Yang energy so social activities can be more lively and fruitful. 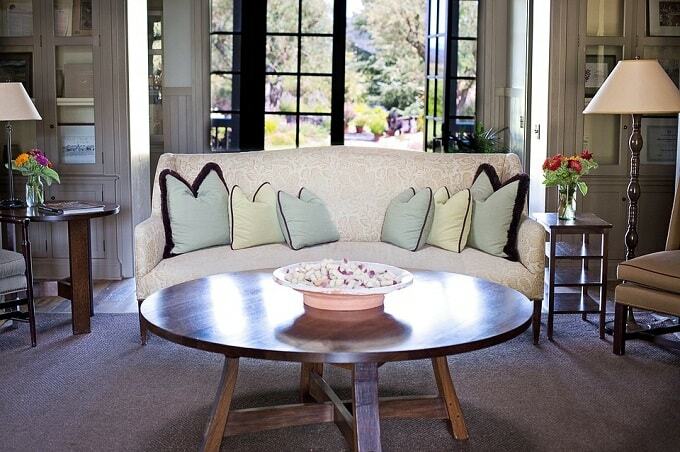 The tips given here can transform your living room into a more comfortable place for both you and your guests. However, if you’re looking for Feng Shui benefits such as attracting love or wealth, following these tips can barely help. For that, you’ll need a full Feng Shui audit and consultation of your house. 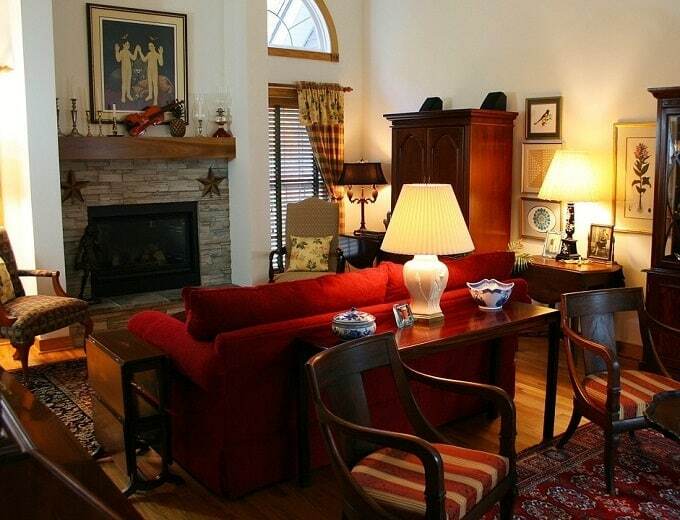 Have you followed any of these living room Feng Shui tips? How has it worked for you? Comment below and share your story with us! There should be thoughts posted regarding small living areas, as many people are in studios type settings. How to setup these type environments would be helpful. For example. I live in a 400 sq foot area and I do not have a bedroom…I sleep in living area at night and it is living room during the day. My closet area is a work space and closet. Thanks for letting me know. This is a great idea for a separate blog post! I have a deep set entry way to the front door to the house. What can I do to make it safe and welcoming? There’s many that you can do! Keep the place bright, place plants or flowers, touch it up with colors, and of course keep the area clean! Always do what makes you comfortable in the first place. Thanks for these interior decoration tips, were helpful to me. My living room is in the Southwest, colors are mostly beige, yellow and orange. I would like to place two armchairs with a deep green upholstery fabric (I like the contrast). Would you think that’s OK? I understand that green is of the Wood element and weakens the Earth element of the SW. But is it an absolute no-no or can it be used sparingly? Thanks. Yes, it can be used sparingly. You should put more emphasis on the colors you like than using colors associated with the Five Elements using the Bagua.